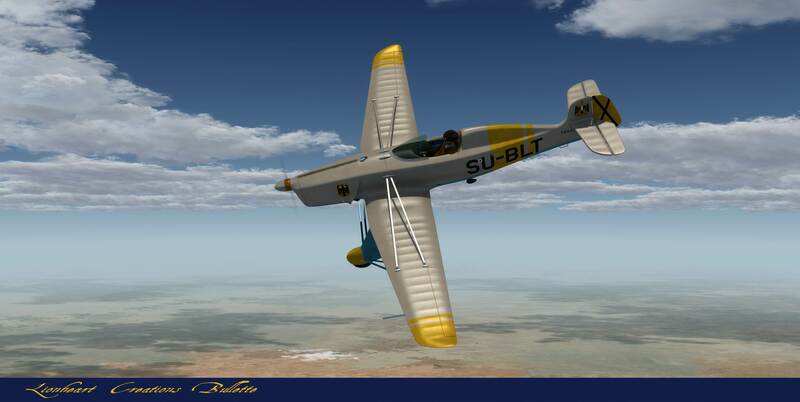 Introducing the exciting, classic Proton Bullette, the single seat trainer of the 1930's and 40's. The Bullette was a mix of the best of Germany's aircraft era, sporting a fuselage that was quite similar to the Bucker Jungman with its bowed down engine cowling, allowing pilots to see over the cowling much better. The wings were made similar to Junkers swept back wing design. The propulsion was the inverted V-8 by Argus engine company featuring 245 HP. The front cowling sported the famous scoop shape that was made famous by the Messerschmidt Me-108 and the Fieseler Storch. Lastly, the B-37 model, the first model that went into production, featured flamboyant, full fairing landing gear designs that gave the Bullette a very 'stylish' 1930's appearance. The Bullette's cockpit was very tight which would allow only so much room for instrumentation. Some instruments were placed along the sides of the interior. The aircraft also featured a very small set of wings that were a mear 4.87 Meter / 16 feet wingspan, making landings faster then your normal aircraft of that era. With that, you had what could be summed up as a Messerschmidt Bf-109 and a Piper Cub, mixed into one, or perhaps a Bucker / Junkers collaberation to make a mini air-racer of the 1930's. 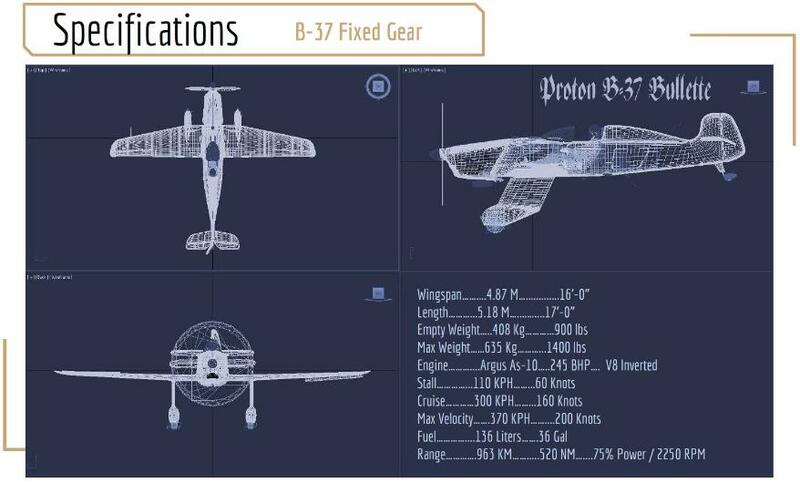 Two Model Ranges: B-37 Fixed Gear and B-40 Retractable Gear models. 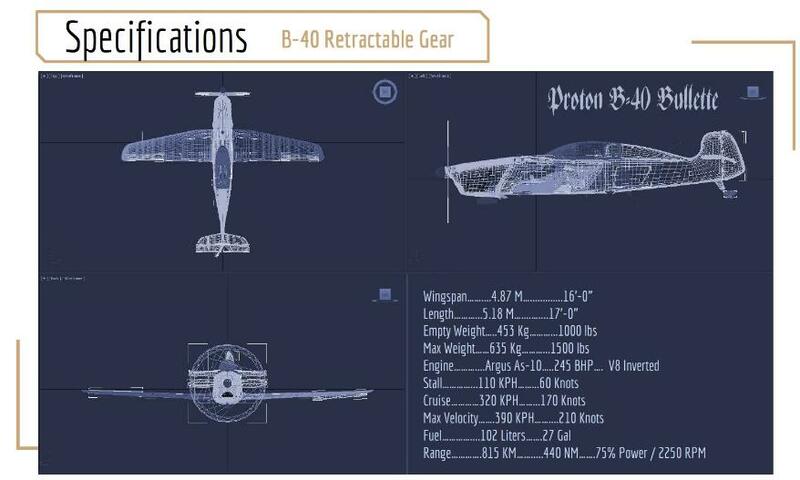 B-37 has both Cantilever and Strut versions. TheCantilever design came about in 1940. Two Canopy Variants: The B-40 has two canopy versions; open cockpit and a full canopy. Full Canopy came much later and only 30% of production planes were fitted with full canopy assemblies. Split Flaps: The flap assemblies were made of spruce wood with lattice ribbing for thin construction. Very lite weight as well. These open below the wing, with the top being solid and non-hinged. Thus the flaps act also like speed brakes. Full flaps will slow the Bullette down moderately, even in a steep dive. Custom Nav Light Assemblies: These are unique, aerodynamic, dome shaped color discs mounted under the upward curved wingtips. They appear to be large, colored circles. Glass on the original planes. 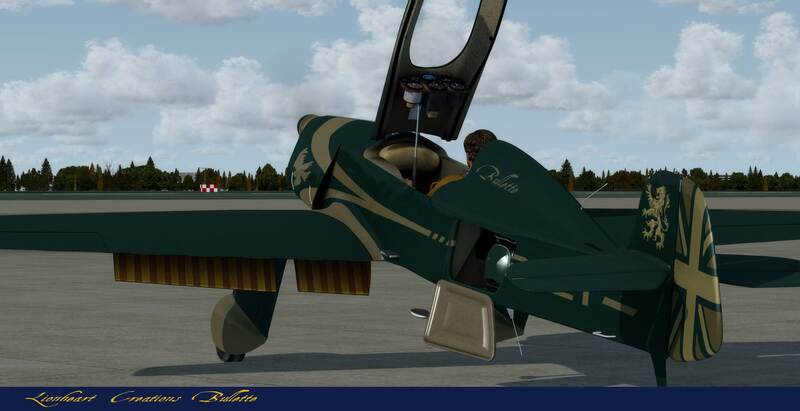 Argus As-10 Engine: This features a very smooth engine soundpack that replicates a V-8 engine that has a very low growl through the tuned dual belly mounted wide exhaust pipes. The Argus is an inverted V-8, totally air-cooled. These were also fitted in the Fieseler Storch aircraft. 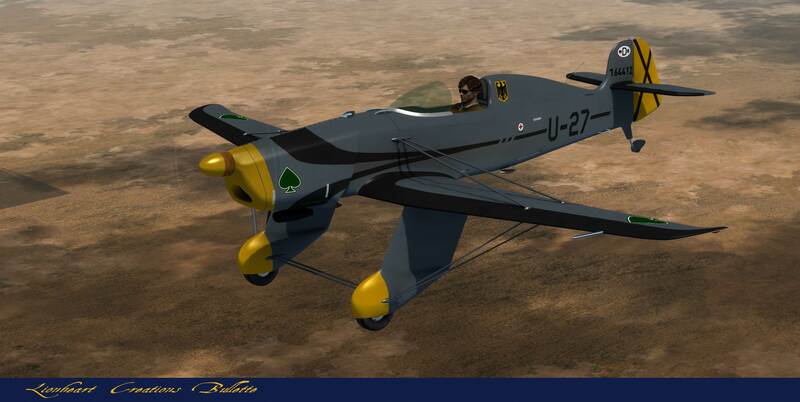 Auto Pilot: For those sim pilots that appreciate auto-pilot, we have that fitted to our Bullettes. 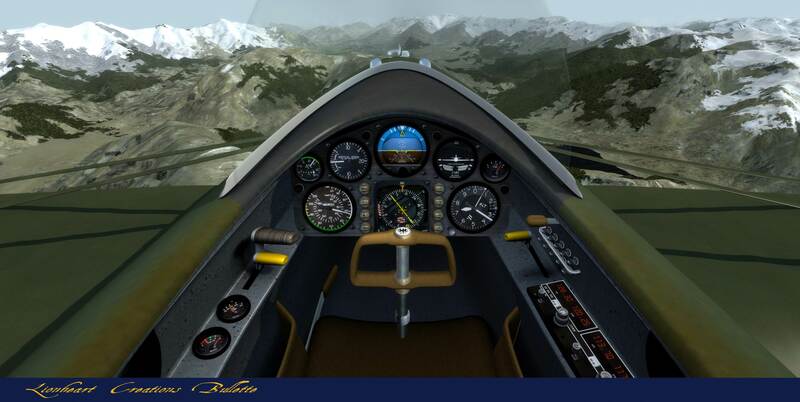 See the Autopilot section in this manual for more information. Readouts of the AP modes are indicated on the HSI instrument. Dual Metric ‘or’ SAE Readouts for Vertical Speed (VSI) Indicator and Altimeter Instruments. The Airspeed Indicator registers both KPH and Knots. Clicking on the top area of the VSI and Altimeter switches from Metric to Nautical readout faces. 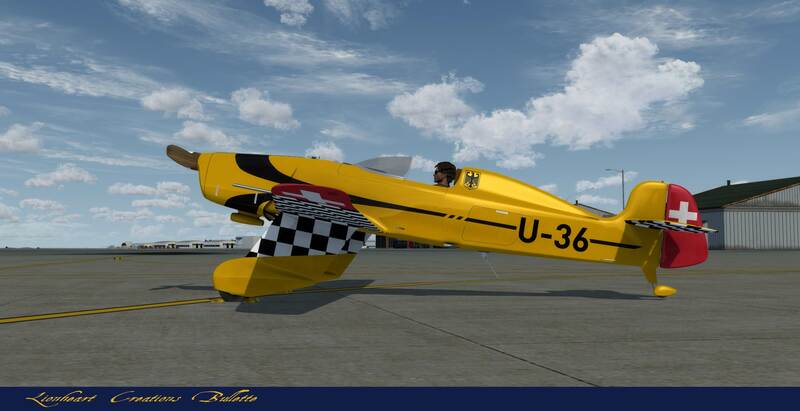 You can download the free Flight and Owners Manual for this plane. It is packed with diagrams and screenshots and easily shows you all the features of the Proton Bullette. B-40 BULLETTE RETRACTABLE GEAR MODEL: This is the sleek, slippery version of the Bullette lines, the B-40 advanced trainer with retractable landing gear. Featuring an electric cable drawn retraction system and coil spring extension system, the liteweight gear system worked quite well on the B-40 Series. With the RG variant came a 100 pound weight gain and nearly 10 gallons of fuel reduction, but a gain of 10 knots in cruise speed. The cockpit of the B-40 is a bit tight. Probably more like a glove. To ingress this little craft, you pop open the top canopy which is actually sort of a cap over the cockpit. As you lift up the canopy cover, you'll see the step strut and a small slide-out step retract out of the fuselage. You climb up those steps into the plane. Your wings are too far forward to step on to get in. You slide into the seat and reach up and pull down the canopy cover and then find yourself sealed into the tight Bullette cabin, your shoulders against the opening, your arms locating to the arm rests which are filled with radios and instruments and switches and levers. Its 'very' tight, so only the basics are fitted into this bird.